The services provided by the mapping department of the Tuscaloosa County Tax Assessor’s Office are a function of real property appraisal. Property ownership maps are created and updated by the mapping department to provide current maps depicting the location, size and ownership of tax parcels, according to Alabama Department of Revenue specifications. 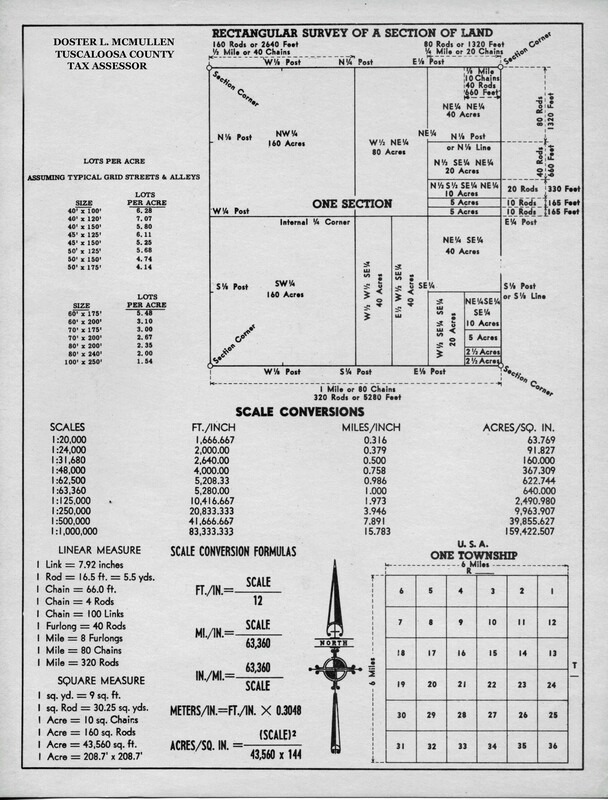 The purpose of these maps is to assist the appraisal office in determining the proper value for real property taxation. The mapping department staff updates the maps with the aide of recorded documents such as deeds, subdivision plats and wills. Property assessments and surveys are also invaluable tools used in the update process, as property owners should always file an assessment with the tax assessor whenever new deeds are recorded in the Probate Office. Tax maps are to be used for tax purposes only and should never be used for conveyance. Tax maps are available to the public at the Tuscaloosa County Tax Assessor’s Office and are also available online at https://www.alabamagis.com/Tuscaloosa/. The maps are based on the Public Land Surveying System (Rectangular Survey System).